The young Brasserie des Fagnes, which means "the brewery of the fens",at 2 km from La Calestienne, is a relmatively big café-brewery where a blond and a dark Super des Fagnes is brewed. At the spot itself you can taste different and ever changing experimental brewings; don't forget to ask the beer in which they use forest fruit in late summertime! 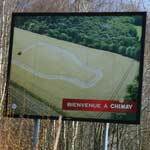 Chimay, at 13 km from La Calestienne, is the youngest trappist abbey from Belgium, but they are the biggest beer producer under trappist monks. 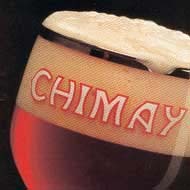 All Chimay beers are available in 33 cl bottles and in 75 cl or "bordelaise" bottles with cork. The Chimay blue or "Grande Réserve" is the darkest and strongest of all three; the red Chimay has a soft smell of malt and a spicy flavour, and the golden coloured tripel or "Cinq cents" is the only blonde Chimay beer. De Brouwerij Caracole in Falmignoul, op 36 km van La Calestienne, dankt haar naam aan de inwoners van Namen, bekend om hun traagheid. Witte Troublette, blonde Saxo, amberkleurige Caracole en de donkere Nostradamus worden gebrouwen in koperen kuipen die met hout gestookt worden. In Silenrieux, at 30 km from La Calestienne, there is a brewery with the not really very original name of Brasserie de Silenrieux. 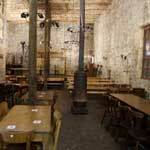 Sara and Joseph, the two principal beers, brewed on this place, have a alcohol concentration of an ordinary pils beer. Sara is a beer made with buckwheat, Joseph is made with spelt, both cereals that have been much more common on poor soils in earlier days, and are cultivated nowadays mainly as cattle food. 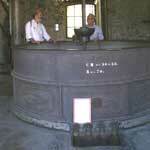 Just before crossing the border with France, at 28 km from La Calestienne, the steam brewery Février has been restaurated as Brasserie de la Thierache: maltery, generator and steam engine, cooling and bottelling installation have been complated with a bar where your ticket is worth a special beer. The Gambrinus Drivers Museum, at 18 km from La Calestienne, claims to be the only museum specialised in brewery trucks in the world. Aside the collection of brewery trucks and lots of other beer parafernalia there is a bar at this nineteenth century maltery.